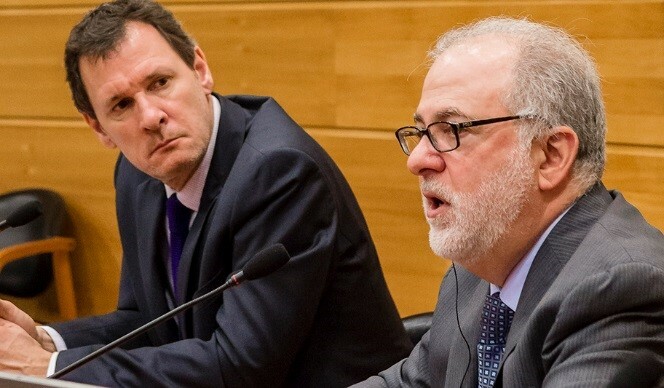 Coherent Economics President Dr. Alan Frankel testified before the Tribunal de Defensa de la Libre Competencia - Chile's competition court - in Santiago, Chile on November 11-12 concerning the competitive structure of Chile's credit card and debit card acquiring (merchant services) market. In Chile, the major banks together formed Transbank, which as a result is a monopoly provider of card acceptance services to Chilean merchants. Dr. Frankel was retained by the Fiscalía Nacional Económica, the national competition authority, to analyze the structure of the market and how to reform the market to make it more competitive. As a result of a Supreme Court decision in the case, the Tribunal will issue its decision in the form of a recommendation to the President of the Republic of Chile for the submission of new proposed legislation. Dr. Alan Frankel Presenting at the Centro de Estudios Públicos in Santiago, Chile, November 10, 2015. Prior to delivering his testimony, Dr. Frankel spoke about the history of competition and monopoly power in payment systems before the Centro de Estudios Públicos (CEP), Chile's preeminent think tank. His presentation slides are available below and on the CEP website. Last week, Judge Nicholas Garaufis of the U.S. District Court for the Eastern District of New York issued his much anticipated decision in an antitrust case brought by the U.S. Department of Justice and seventeen state attorneys general. The case challenged certain aspects of “Non-Discrimination Provisions” (“NDPs”) contained in American Express’s contracts with merchants that accept AmEx cards. The NDPs prohibit many merchant strategies to encourage or reward the use of one payment type over another, one card brand over another, or one bank’s cards over those issued by another bank. The court found for the plaintiffs on nearly all issues. Judge Garaufis’ decision is the latest in a long series of incremental competitive reforms – some resulting from statute and some from litigation – to the credit card market. In the early 1980s, merchants obtained the right to offer discounts for use of cash. But network rules prohibited merchants from offering discounts for other payment types or brands, surcharging the use of any card brand, or discouraging the use of a costly brand. Even informing a customer of the cost to the merchant of accepting a particular brand could lead the merchant to be terminated by the network. These restrictions have had the collective effect of stifling competition and maintaining anticompetitively high merchant fees for decades. American Express has historically been the highest cost card brand in wide use, and has had an obvious interest in preventing merchants from steering their customers to other brands and payment types. American Express argued that it lacks market power (and thus could not harm the public) because the relevant market includes both card issuing and merchant acceptance of card transactions, and (AmEx claimed) debit cards compete with credit cards in the same relevant market. Instead, Judge Garaufis followed other courts in finding that there was a relevant market limited to general purpose card acceptance services offered to merchants. Moreover, he found that AmEx possesses market power in that market, and that its NDPs have demonstrable anticompetitive effects. This decision, if it withstands appeal, will also likely enhance the effectiveness of prior settlements with Visa and MasterCard. In 2010, MasterCard and Visa entered into a consent settlement with the Department of Justice in which they agreed to permit merchants to offer differential discounts or other benefits to use a preferred card. AmEx declined to agree to similar terms, resulting in the current litigation. Then, in 2012, MasterCard and Visa settled class action litigation, permitting (in part) merchants to surcharge those brands of credit cards so long as they also surcharged more costly brands (e.g., AmEx) by at least as much. That class settlement prohibits surcharges of MasterCard or Visa debit cards unless the Dodd-Frank regulation of debit interchange fees is repealed. But American Express does not permit a merchant to surcharge AmEx credit cards unless the merchant also surcharges debit cards. American Express’s prohibition on discounts or steering to rival credit card brands also remained in effect. Judge Garaufis’ decision in the DOJ case, if it stands, will likely enhance the effectiveness of the MasterCard-Visa settlement relief in the DOJ litigation (with respect to discounts and “positive” steering) by freeing merchants to implement differential discounting and other strategies – strategies that American Express’s NDP has until now effectively foreclosed. Collectively, these reforms contribute to a more competitive marketplace. The class settlements are being challenged, and American Express is likely to appeal Judge Garaufis’ decision. But if all remain in place, merchants will be permitted to offer discounts for use of debit (Dodd-Frank), differential discounts and perks for use of particular credit cards (DOJ settlements with MasterCard and Visa and judgment in the AmEx case), and common (“parity”) surcharges across all brands for use of credit cards (class action settlements). It has taken a long time, and none of these developments directly reduce the level of credit card interchange fees, but these cumulative efforts by the government and private litigants are gradually (though incompletely) deregulating the formerly self-regulated, anticompetitive merchant card acceptance marketplace. These reforms won’t make merchant fees competitive immediately, but by enhancing competitive forces in this industry, they should work over time to constrain the level of credit card acceptance fees. On Tuesday, January 13th, 2015, Dr. Alan Frankel participated in a panel discussion hosted by the Antitrust Section of the American Bar Association. The program, "Who May Be Steering Off-Course: Updates on the Anti-Steering Rules Challenges," covered recent developments in enforcement actions and private suits challenging the rules governing merchant acceptance of credit card transactions. Audio of the program can be accessed below, or on the Association's website. Dr. Frankel begins speaking at the 6:53 mark. On Tuesday, December 2, 2014, Dr. Alan Frankel spoke at the American Antitrust Institute's 2014 Private Antitrust Enforcement Conference. Dr. Frankel was among panelists asked to discuss the topic, "Antitrust Issues Arising out of Multiple Recent Class Actions by Merchants and Consumers Against Payment Card Networks." The conference was held at the National Press Club in Washington, D.C. Audio of the panel session can be found below, or accessed on the institute's website. Dr. Frankel begins speaking at the 11:40 mark.